Continuing on with my look at the practice of veneering, an effort spurred in large part as a result of an article in Popular Woodworking #185, by Marc Adams. I want to make the case for solid wood construction while countering some of the points made in that article, which was very much pro-veneer. The veneer in question here is the industrially-produced kind, the vast bulk of which is used in industrially-produced furniture. Veblen said that a leisure class is found at both ends of the socio-economic spectrum. Veneer is like that too, it is found in the cheapest as well as in the costliest furniture. Increasingly, due to various factors, veneered furniture occupies virtually every price point and is becoming more the norm in the market than solid wood furniture. Most woodworking shops are veneering shops. 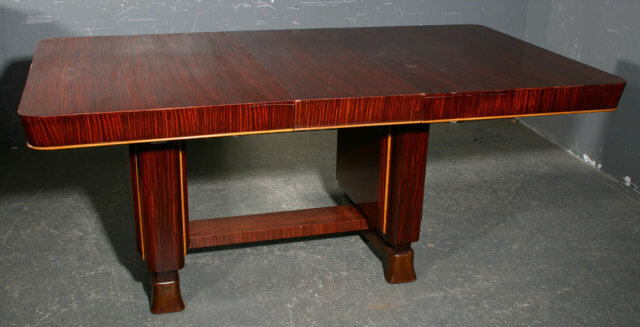 I wanted to look at some examples from the highest end of veneered furniture, specifically at some work by Émile-Jacques Ruhlmann, a designer from Paris whose furniture pieces, in the 1920’s, achieved selling prices on a par with real estate at the time. Nice work if you can get it, as they say. The above photo came from a site which also links to reproduction work by Frank Pollaro, so I am not entirely sure if the piece shown is an original or reproduction. No matter, as it does not affect my argument. Ruhlmann’s pieces, in reaction it would appear to the drive for un-concealed construction, simple joinery and clean lines which were characteristic of the preceding Arts and Crafts Movement (termed L’Art Nouveau in France), were all about luxury. Exotic materials such as sharkskin, marble, gilt mounts, shagreen, ivory, and costly veneers, with Macassar Ebony and Andaman Padouk burl (‘Amboyna’ burl) being widely used by Ruhlmann. His pieces exhibit a very high degree of craftsmanship, technical innovation and have absolutely beautiful lines. Some of the ivory inlay work I have seen on his Chiffonier are truly astonishing – literally months and months of painstaking effort. I really like the way Ruhlman proportions the legs on many of his pieces. I admire his work greatly and draw inspiration from it – but for one niggling detail. And this detail is one of the reasons I find the ‘illusion’ of solid wood that veneer is meant to portray unconvincing in many cases – an illusion so unconvincing that I am left to conclude that veneer may not really be about imitating the logic of solid wood. At least when it comes to Ruhlmann’s work. Looking at the apron on the piece, the veneer has been placed so that the grain of the material runs vertically. While the orientation makes the apron’s grain harmoniously in alignment with the grain of the legs (which are also veneered), if the apron were instead a piece of solid wood you would have a fundamental problem with such a construction. In an apron of solid wood having the grain running vertically, not only would you need an extraordinarily wide board (or would glue up several pieces to obtain the required width), but the grain in that orientation would be very vulnerable to shear parallel to grain. In other words, in real wood you would never construct a piece that way. It would probably break a short while down the line. If the apron was solid wood, in contrast, the grain would run horizontally, as the apron behaves structurally as a beam. That’s the structurally-logical arrangement when it comes to real wood. Ruhlmann invariably oriented the veneer for the purposes of overall visual effect first and foremost – the structural logic of the pieces was utterly disconnected from the appearance. In solid wood, the above construction would be an impossibility. I often look at Ruhlmann pieces and realize that while I could duplicate the lines, overall form and material in solid wood, I could not achieve the same heights of visual effect. This reminds me of how it must be for a good cyclist who wants to win the Tour Du France and comes to realize that the only way to get the glory is to take various performance-enhancing drugs, dope their blood, etc. Cheat in other words. For me, the emphasis on the visual above every other concern (like structure, like sustainable use, etc.) which is a core aspect in the use of veneer is very much akin to a form of cheating. Real wood can’t do that. I’m fine with having limitations. I can’t fly or leap tall buildings in a single bound either. It is tempting to try and follow Ruhlmann, but it goes against my values when I think about it. And to make a piece which did emulate the lines and form of Ruhlmann pieces, though constructed out of solid wood, the opportunity would still be there to produce a very handsome thing. The disconnection of veneer’s appearance from what one would actually have with real wood construction is one of my main objections to the technique of veneering. I appreciate honesty to materials and their qualities – the way they inherently behave. Wood is not plastic or paint, or stone, or steel, especially in terms of its mechanical qualities. Real wood does not always behave predictably and in order to design pieces to last over time, one must understand how wood behaves in response to various interrelated factors, like seasonal moisture changes, and/or the material behavior in response to which part of the tree from which it was cut, and/or in respect to the condition of the tree from which it is cut, or how it was seasoned and dried. Sometimes we don’t have the option of seeing the tree, or controlling the drying, and we must be sensitive and perceptive when we work wood to discover its secrets. Sometimes the wood will not cooperate with our plans. Working wood is a bit like corralling sheep – you’ve done well if you get them all in the pen, but don’t expect them to line up in rows. It can be frustrating at times, but when you succeed it is highly rewarding. I like the uniqueness of every board of wood I encounter, and don’t want to narrow my consideration of that lovely material down to only a valuing of its visual impact. Again, in terms of lines and visual effect, a lovely piece from Ruhlmann, and again, I would choose not to make a piece like that. It is not possible to duplicate such a form in solid wood, much less burl wood. Solid wood has certain natural limitations to be sure – but in those natural limitations lay tremendous avenues for artistic exploration. Consider the vast array of varied lattice door patterns (shōji) the Japanese have developed within the ‘constraints’ of a lightweight wood framed door of about 6′ by 3′. Even within given constraints a clever artisan has virtually limitless opportunities for variety and expression. When you buy veneer, from what I have observed, it comes as an ordered stack of sheets, all having been sliced from the same board or tree trunk. The veneers may have been sliced or peeled sequentially, and a given flitch of veneer is all cut the same way. The wood is generally cut so as to maximize the drama of the resulting veneers, and perhaps most typically the veneer is of face grain orientation (invariably so when rotary peeled). While one could take another board and slice it a different way, so as to obtain edge grain, say, then one runs into a different problem, and a problem which is relatively more critical in veneer world – the color might not match. That other board might have been from a different tree. And, slicing a valuable material in such a way that the figure is not to be displayed to such advantage (as is often the case, the figure is optimally displayed in one particular grain orientation) does not tend to make economic sense in the veneer game, where opportunities to maximize profit from the log are a primary drive. So there you are with a package of face grain slices to work with, and a cabinet or case of plywood to be covered. And so, like with the fellow who’s only tool is a hammer and the world appears as a nail, every surface gets covered with face grain. It’s the simplest and quickest approach, requires the least thought, get’s the job done quickly and therefore derives the greatest profit. A slam dunk. No need to even think about grain. ‘Board’ edges are face grain, ‘ends’ are face grain, and so on. The veneer may as well be paint or wallpaper. And that is how Ruhlmann was using it. I do understand that for some artisans the opportunities opened up by veneer in terms of what sort of effect might be achieved are very compelling. And so for those folks the idea of veneer as being akin to paint or wallpaper may well be perfectly acceptable, as their primary artistic drive might be that of the ‘painter of wood’, ala marquetry, etc., and not primarily as a woodworker. And that’s fine – my aim in this post is to address the use of industrial veneer and how that veneer is typically employed, which is in an industrial, mass-production manner. Back to the wood. In solid wood construction, I would tend to avoid using tangentially cut material, except for floating panels. That grain orientation, while in some species gives interesting figure, is prone to the greatest degree of wood movement. Therefore, where possible, I would choose to use wood that is sawn on the radial grain or rift grain orientation, as these grain directions inherently have the least amount of wood movement. With veneer, one can pretty much disregard how wood behaves as a natural material. One overcomes nature through technology I suppose in the case of veneer. We can now slice veneers as thin as 1/40th~1/120th of an inch thick, and depend upon massive log peelers, cranes, tanks to boil the wood, and modern adhesives from our friends in the chemical industry to put it all together. I think that forcing a natural thing to conform to an artificial ideology is nearly always a bad idea, like binding a woman’s feet so they remain child-sized. And if those ladies can’t walk later on as a result, then too bad I guess. One of the main reasons people use veneer -why industry prefers veneer – is the sheer predictability of the material. Instead of carefully choosing grain and cuts of wood from the log or timber one has in light of how a structure will come together and best perform, with sorting veneers, the question is exclusively one of ‘how does it look’? Ooh, maybe I can sequentially bookmatch that? How about a sunburst pattern? There is, of course, also a good amount of effort expended with solid wood in terms of matching grain harmoniously, but it is not the only or even the primary consideration. The diversity and intrigue of natural wood – has been all but reduced to a single assessment of the superficial visuals. And predictability, monoculture if you will, is the result of a unnatural focus on just one aspect of a material and making that material so that all other aspects can be disregarded. Predictability in the making sounds nice, but I suspect that the relationship of the craftsman to material suffers as a result. Most shops I have been in where you see people veneering as a primary activity are shops where ‘it’s just a job’. The craftsman in such a shop is cheated as well. Instead of gaining the knowledge of beautiful and diverse natural woods though working with them, their difficulties of grain, of movement, stiffness or resilience, etc., all there is to worry about is whether one obtained a flat press and tight seams, then on to the spray booth. In many cases, what goes with the monoculture of veneer is a certain sterility, on one hand, where the ‘I’ve got a hammer and everything is a nail’ mindset inherent to veneer and its ‘efficiencies’ and ‘cost effectiveness’ wins out over other considerations. On the other hand, what is obtained as a by-product is a certain desensitization of the viewer through the aesthetic bludgeoning which results from covering every square inch of a space, or a piece, with the same material. Boredom results. The tendency among some to cover a surface wall to wall, floor to ceiling with a given material is far more easily achieved with veneer than solid wood, and in such spaces materials which may have been rare and precious are now cheapened by their over-exposure. Maybe some woods are better left as precious things you would rarely see, except in pieces made with the utmost of care and craftsmanship and sensitivity. A hint of beeswing figure Mahogany, say, on a couple of cabinet door panels on an otherwise standard mahogany piece is exquisite – cover the entire cabinet with veneers of the same wood and it is easy enough to verge into gaudiness. Just because a little of a thing is good does not automatically mean a lot of it is better. The desensitization piece for the viewer of veneered furnishings is not an insignificant matter to me. I think that when furniture is made with veneer, and when that veneer is applied on the substrate so as to have little to nothing in common, appearance-wise, with real wood and how it might be arranged in the same piece, it amounts to deception. A false and misleading message. The person who is surrounded by veneered pieces is surrounded by an illusion that misleads, which defies the logic of, or a connection with, the natural world. A person follows along a panel’s surface with his eyes and rounds a corner to the edge, only to see pretty much the same grain and figure on that edge. One would conclude a very different impression of what ‘wood’ really is as a result. Veneer takes us away from any hope of understanding the diversity of a material and replaces it with something unreal. Little by little, it seems to me, the person in such an environment loses a certain amount of touch with what is real, at least in terms of wood, and the faculties of recognition become dulled or atrophied. For many people today, particularly in urban environments, they almost never get to see and feel real wood. Even in rural areas, the only real wood many people experience is being reduced to the garden rake handle, or perhaps the hockey stick or baseball bat. Maybe the cutting board or the salad forks. All other things which look like wood are either a facsimile or are coated in so many layers of polyurethane that any possible delight that may be realized by the tactile or olfactory pleasures of wood are all but eliminated. And that is a profound loss when you think about it. And like anything else in which you do not have the opportunity to relate to a given thing in an authentic way, the abstraction inherent to veneer, like the abstraction of our largely artificial built environment in general of which veneer is symptomatic, becomes a fundamentally alienating experience. We cease to understand it and eventually we cease to care about it. Many would feel, understandably: why care about a thing that does not last, falls ‘out of fashion’ and just gets tossed in 10 years? Ceasing to care about the natural world, even in small ways, is but a step in the direction of abusing the natural world, or standing by unconcernedly while the natural world is destroyed. For me, veneer is part and parcel of the destructive alienating thrust of Western Culture. That may be a bit extreme a statement for some, but veneer is right up there, in my view, with monoculture agriculture and all its efficiencies, with fraudulent financial instruments and other cons, with the rationalization and planning of all activities so endemic to our culture. Veneer: efficient and predictable, yes, and with a healthy profit margin, but at heart a lie. Another cog in the machine of disposable culture and manufactured reality. Aren’t we surrounded enough these days by deception? Isn’t it time we considered building to last and putting pre-planned obsolescence on the ash heap of history where it belongs? Isn’t is time we valued trees not simply as a resource to be economically maximized for short term gain but as a renewable, durable and repairable medium which can bring beauty and connection with nature into our lives? I would suggest that one way forward here is with solid wood, not veneer. I appreciate this series of posts, and can't help but notice your writing skills are more-or-less impeccable. I'm sure I'll be referencing these in the future. that was most generous of you. I always feel my writing could use another few rounds of editing, so your words were encouraging. I don't have your intellect but intuitively I agree with you. The application of veneer on an MDF substrate used for jigs and throwaways seems deceptive. The stuff is lifeless and smells bad. I could not use it as a scaffold for veneer without feeling like a fraud. That said, I think of the fragility and impermanence of canvas which takes on life and sometimes transcendence when worked by an artist. Pine furniture painted with a vision may be as moving as a work of subtle design and consummate joinery. Points granted for respect of material, but also for the fire of passion. Thank you for your insight. There's no other woodworker writing who does what you do. How about the technical uses of veneer (or is plywood the correct term in that case)? One of the most beautiful and innovative airplanes ever made (in my opinion, of course) was the De Havilland Mosquito, which was built in a innovative balsawood between Canadian birch sandwich construction. The use of plywood construction in aircraft can be traced back to the LFG Roland D.II of WW I, but the technique matured in the Mosquito and its descendants. There is a group in New Zealand who are effectively builing a Mosquito from scratch; Mosquito Aircraft restoration. Their gallery pages paint a very intersting picture of how to do techical contruction in wood. many thanks for your kind comments. I agree that if painting is one's œuvre, then wood is a fine substrate for that and some great work has been done in that regard. as a woodworker however, I tend to think that mother nature is truly the greatest painter of all in terms of the dizzying array of wood we have available to use to make useful objects. sure, I think plywood has some great qualities as a material (as I noted in post I of this thread), and has been used with great success to make boats and aircraft. Also, of course, when it comes to aircraft, let's not forget the Hughes H-4 Hercules, nicknamed the 'Spruce Goose' (ironic, perhaps, since the wood employed was nearly all birch!). I think they would have preferred aluminum for that plane mind you, but there was a shortage. Once again, another thought-provoking post. I must apologize for reading more into your initial post on this topic than intended and unfairly characterizing your point of view. You make a very well-reasoned and compelling case for your position on the use of veneer v. solid wood. Although you and I will likely always disagree with respect to the value/use of veneer, I respect the uncompromising approach you take in both your work and writing. I came across your blog while on a search for information about the veneering techniques of Emile Ruhlmann, so that I might gain something that might aid my own attempts at veneering. I've been working in solid wood for thirty years and only recently started using veneers. I'd like to explain why I don't agree with everything in your post. Like you, I suspect, I've spent many hours at auctions looking at old furniture, seeking inspiration and maybe a bargain or two. Many times I've been disappointed to discover a piece that looked solid was in fact covered in “cheap” veneer. Of course at the time, those veneers might have been expensive relative to other veneers – I have no idea. But the purpose of using those veneers was to give the impression that the article was made from a scarcer and more expensive material – i.e., figured solid wood. It was a step above the contemporaneous practice of painting oak woodgrain on pine, or rosewood grain on mahogany, but the purpose was the same. That's what makes it disappointing and “cheap”. Of course if your purpose is to make a veneered surface look like it is made from solid wood, then you have to orient the grain of the veneer in a plausible direction, and use the new “board” in a way that makes structural sense. And no, you would not use burl wood anywhere that came under stress. Ruhlmann was not a cabinet maker. He was a painter and a decorator. If all his furniture had been covered in paint you presumably would not be unhappy with what he created, although there wouldn't be much interest in it either. Ruhlmann painted his sculptures with the rich, deep, chatoyant palette that only natural wood can provide. Approaching one of his veneered surfaces is like descending into a fractal image – new details emerge at every scale. You can't get that with paint, or in any other medium I know of. So I think that what you complain about is actually the precise thing that makes Ruhlmann so great. By divorcing veneers from the task of looking like solid wood he actually liberated the craft, took it in new directions and lifted it to new heights. I'm not sure how much attention this blog gets, but I'll bookmark it and check in occasionally to see if the debate continues. thanks for taking the time to post such a thoughtful comment. While I agree Ruhlmann took cabinet making in new directions, and that the work was executed with consummate skill, and that this 'divorce' between structure and form that veneer makes possible might be 'liberation' of a sort, in the end I don't like the direction he took. 'Freedom' from one thing is very often converted into enslavement to another thing. With every medium there is a spectrum of adulteration in the materials made possible by technology, from raw state to a point where we no longer recognize the material for what it is. Indeed, we live in a world where the vast majority of materials we interact with and consume are highly adulterated. And yes this is often done for entirely rational reasons. But, for me, when it comes to wood, I draw a line in regards to paths I will and will not walk down, preferring to eschew the particular advantages conferred by veneer, for the reasons I've laid out, and work to make objects with solid wood. While Ruhlmann designed some beautiful objects, it is also possible to design equally beautiful pieces (which cannot duplicate Ruhlmann's work any more than veneer can truly replicate solid wood) using solid wood and that is where I choose to engage the medium. On the one hand I can appreciate the form and beautiful craft of Ruhlmann's work (and yes I realize he was a designer not a maker), yet I can also decide that it is not the sort of work I wish to pursue myself. Each artisan must make their own choices for the reasons that matter to them. I can't disagree with anything there. . .
Actually, I'm not overly fond of Ruhlmann's shapes. They are a bit too unapproachable for me – I'd be afraid of kicking a leg by mistake and breaking it. It's really the veneering techniques of his craftsmen that I would like to discover. I've seen round corners where the veneer looks like it has been stretched like a rubber sheet. There's no sign of any seam, and the figure seems continuous. Amazing. I'm with Lorne, I find the perfect word for Ruhlmann's shapes to be “unapproachable”, and indeed some of that effect may be from the somewhat gaudy veneer as well. But it was definitely worth seeing due to its uniqueness. Also, thanks for sharing Lorne, I'd like to see an example of the rounded edge you're talking about. Chris, I was just wondering what you thought of LAMINATED wood. This is regular wood that is inordinately strong and purposeful, and yet can take unnatural yet organic shapes and curves. And in many cases, while veneer's goal is to hide, laminated or “ply” wood can REVEAL the unique nature of the structure. So, in other words I find it utilitarian and attractive, with a bonus for being both simultaneously. I don't think I'm alone in this regard.. for example, I lost anything I could claim as unique aesthetic appreciation it when it went mainstream and I realized it's one of Chipotle's two token accents, which are debatably the most prominent “materials” accents in any restaurant chain, possibly in history. At least that I can think of… Anyway, the raw structural appeal NOT shown in Ruhlmann's illusory work is the very reason I find it in some cases more attractive than a solid piece of wood, which can express (for me) more of an undertone of excess for the same amount of strength. Example, a laminated beam is much stronger than a normal timber in less space and therefore has a fundamental minimalist elegance. But to appreciate it one certainly has to realize the differences between say OSB, the edge of a skateboard, and a piece of MDF gilded in an exotic hardwood veneer. Anyway, after reading such an interesting and thorough article on veneers explicitly, and since you're an advocate of solid wood, I am wondering your perception of lamination OF veneers aka plywood as both structural and visual art. Nothing is hidden or deceptive, while being stronger than nature's orginal form, and therefore has earned the right to express itself in some of the more unnatural ways for which your rightfully criticize veneer. While I share your general distaste for cosmetic veneers for various reasons, including how they inevitably age or wear, I find enough “veneers” (albeit very thick ones) arranged purposefully to sometimes add more effect and use for the same amount of tree. Thanks for a very thorough and interesting blog; I have been directed here twice in 2 days from browsing various topics and I have figured out, bookmarked. great to hear from you and thanks for taking the time to share your thoughts. I am perfectly fine with structures which demonstrate truth to materials, so plywood bent laminations, from chairs to tennis racquets are fine by me. It is a strong and efficient means of constructing something, and it is not trying to hide what it is. I have nothing against plywood as such, except for the fact that it is getting crappier by the day, and I don't consider it a material associated to fine furniture. Given a choice between a living space with solid beams overhead and glu-lams, I would choose the solid beams. Sometimes structural situations call for sections which are not reasonable in solid wood, so glue-lams, lvl's and structural steel can be used instead, but I'd rather not see that stuff myself. In the Greene and Greene Blacker house there are attractive timber trusses in the living space which are entirely decorative, the actual load carried by steel I-beams concealed above. So there is a point for me even where truth-to-materials be damned, I'd rather see timber. Take that too far though, where everything is faux, and I'll run in the other direction. thanks for the response. The more I read your blog after that article the more I learned, and a lot of it was very much interesting, and within my interests! As for plywood “glu-lam” I still find a big difference between OSB and a true 7-ply (or most odd numbers) structure. I also doubt chip-boards durability long term, even in some of the “paralam” beams you may find. At the same time, I also think that homemade laminates are intriguing: I plan on laminating a 3-way of ash/oak for minimalist sawhorses, and larger numbers exhibit interest if you chamfer edges, etc, in various ways. It comes to personal opinion and taste but I prefer the minimalist approach on structural issues when possible because of the state of wood in general.. it's not being replenished in the rate we use it. Of course, technology and industry have a way of reversing these kinds of trends. Either way, I guess we can both agree that more attractive laminations could be standardized, and they currently aren't too beautiful beyond their function, but I would say that this topic is a poor starting point to your blog!! While interesting, I was finding a lot beyond philosophy in most other threads!! I really must compliment you on your Mahogany chairs, quite beautiful, and I normally don't take much interest in sitting devices. Also, do you have a link to your Japanese splay sawhorse design? Thanks for the persistent effort for improvement on your own work and the whole of woodworking. This is very attractive web blog view to woodworking.Thanks for sharing the useful information.